Days before the iconic Monza circuit was dominated by a frenzy of the world&apos;s fastest cars and drivers, a group of legends from another sport took centre stage on the Italian Grand Prix starting grid. 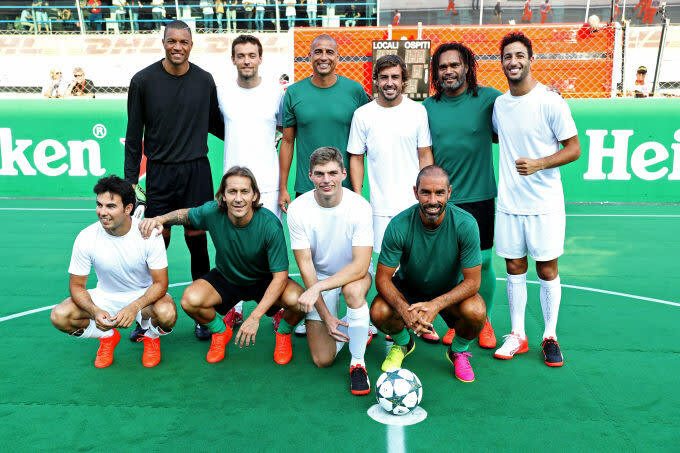 To raise money for those affected by the devastating earthquakes that rocked Italy just one week earlier, a group of Champions League legends – Dida, Michel Salgado, Christian Karambeu, Robert Pires and David Trezeguet – laced up their boots again for a 5-a-side game against an all-star team of F1 drivers. 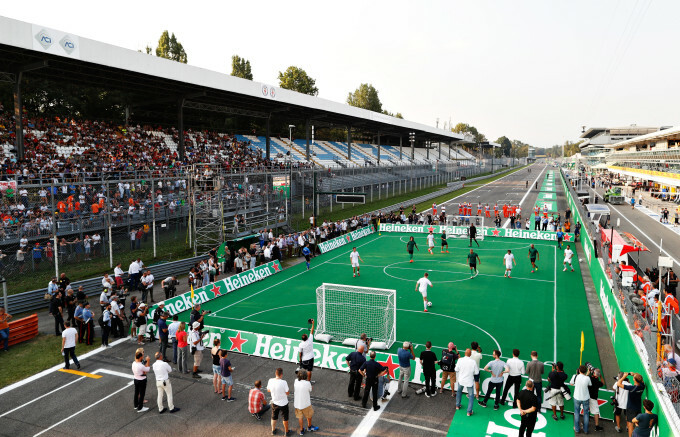 The teams were brought together by Heineken – partners of UEFA Champions League and, now, Formula 1 – who donated €1,000 for every goal scored in the 5-a-side game, which eventually came to a total of €50,000. We made a pit stop with Arsenal and Real Madrid legends Robert Pires and Michel Salgado after the full-time whistle, to get their thoughts on this season, 5-a-side legends and how football can be used as a force for good. Not many people get the opportunity to play football in a setting like this. How much fun was that? Michel Salgado: It was really good, enjoyable. This is the first time we’ve done anything like that – for Heineken it’s the same, the first time they’ve worked with F1 – and we’re thankful to them for giving us the chance to do this. We love F1, we got the chance to play football again and, of course, to raise money for a brilliant cause. That’s what the most important thing about this was, raising money for Italy. Robert Pires: We’re retired and with our profile, it’s very important to help the people. This was such a great opportunity and we need to thank Formula 1 and Heineken – Heineken organised all of this – to play on Monza, one of the best F1 circuits in the world, it’s really a privilege. The most important and humbling thing is to be doing this for charity, people need help and that’s why I’m here. How impressed were you with the skills from some of the F1 drivers? MS: I know Fernando Alonso really well, because we’ve played so many games together – especially in Dubai, when he finds the time. But I know they all love football and they support football. It wasn’t easy for them to come in here and play against, so next time, we have to drive some cars instead! RP: In general, they all had good technique but the best is Fernando Alonso. I think he plays football regularly with his friends and he’s got plenty of ability. MS: Well that’s what they said when we were playing; ‘hey, come on guys – let’s try some F1 cars and see how that goes’. It was amazing and we all had fun, it was a good chance for the drivers to relax before their real job starts on the track. RP: That’d be very interesting, for sure. I love F1, the cars and the speed. I love the race in Monaco for example, because there’s such a special atmosphere on the streets and also, the race is very technical. I’m a big racing fan in general, so I’d love to try the cars. These F1 drivers were obviously football fans. Are you racing fans? MS: I follow F1, of course. For us, in Spain, Alonso has been the real turning point. It’s not easy for a driver to win two world championships and it was unbelievable for Spain to have someone that could do that for us. Since that time, I’ve been following him and supporting him. This isn’t the first track I’ve visited but it’s certainly the first time I’ve played football on one. I’m assuming you’ve played plenty of 5-a-side games in training throughout your career. Who have been some of the best 5-a-side players you’ve worked with? MS: Wow, I can tell you some names that played with me at Real Madrid and there’s so many legends, everything is there. You know Roberto Carlos, Fernando Hierro, Raul, Zizou, Figo, Makelele, Ronaldo – the big one! – and Cristiano Ronaldo afterwards…pick any of those guys and you’d have an incredible team. RP: It’s a hard question, I played with some great players! I think Jens Lehmann in goal and Vieira just in front. I’d put myself in there and, of course, Thierry Henry and Dennis Bergkamp. It’s a good line up, no? Let’s quickly get your thoughts on Arsenal, Robert. We’re a few weeks into the season and the transfer window has closed – what are you expecting from the season ahead? RP: I always have a very good feeling with Arsenal. The objective always is to win the title but the big difference and them and Man United or Man City is they spend a lot of money for the big players, but when I see the names on paper for Arsenal…the squad is fantastic. Wenger spent some money on three players and I think they’re great quality signings – Mustafi for example is a great choice, he’s a great defender with lots of experience. He played with the German national team so we know his quality. They also have so many options up front because we have Giroud – but there’s also the choice of Alexis Sanchez or Lucas Perez. And Michel, as a Real Madrid legend, how do you see the season panning out in Spain? MS: I think the difference between Real Madrid and Barcelona against the rest of the league is always getting bigger. 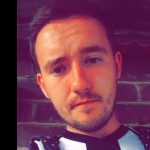 It’s going to be a league of two and I’m not sure if Atletico Madrid are really going to be there, what they’ve done is amazing – reaching the Champions League final twice and winning the league – but I think they’re starting to fall behind. For Zizou, winning La Liga is the real challenge. They need to win the league after so many years without it. Did you see Zidane as management material when you played alongside him? MS: When he retired, he said he’d never be a manager and it wasn’t in his plans. But after two years out, he missed football a lot. I think he retired a little bit early, he could have gone on for at least another season, and it would have been a pleasure for us to have him. When you retire, you start to try different things and you choose the one you enjoy the most. As a player, it’s difficult to know if you’ll be a good manager or not because you might think you can’t deal with the dressing room or won&apos;t enjoy the game from the sidelines. There’s also punditry and careers on TV, so football gives you many different options, but I think Zizou has made the right choice – winning the Champions League in less than a year is an incredible achievement. Heineken Champions of the Grid 2016 took place ahead of the Italian Grand Prix. Heineken is a partner of UEFA Champions League and Formula 1. For more, follow @Heineken on Twitter and Instagram.